Headquartered in Wisconsin, Advanced Comfort Technology, Inc., is a family-owned company that distributes DCC Waterbeds worldwide. ACT, Inc., has been improving dairy cow comfort by providing waterbeds for cows since 1999. 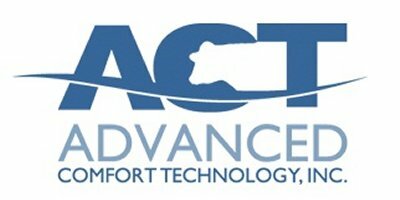 Advanced Comfort Technology, Inc. (ACT, Inc.) is a family-owned and operated international agriculture business, focusing on products that improve efficiencies in dairy farming. Dean and Audrey Throndsen founded the company in 2003. In the same year, they patented the design of (DCC Waterbeds) Dual Chamber Cow Waterbeds.ACT, Inc., partners with local dealers around the world, providing sales, service, and installation of DCC Waterbeds. Currently, DCC Waterbeds are installed in dairy barns in 20 countries. DCC Waterbeds offer a long-lasting, comfortable, low-maintenance solution to a dairy management challenge - consistent cow comfort. Here at ACT, Inc., we work hard to educate the dairy industry about how DCC Waterbeds benefit dairy operations and help solve everyday challenges. We know the value of working with a local dealer network and sell exclusively through local dealers. We share your passions of helping dairy producers build successful farm operations, and we know DCC Waterbeds can become a valuable part of your dairy sales operation. DCC Waterbeds have been in dairy barns for more than a decade, delivering proven cow comfort and farm management benefits. DCC Waterbeds are the only bedding surface that provides consistent comfort for the cow each and every time she lies down. DCC Waterbeds float the pressure points, and even after thousands of uses, they return to their original shape, ensuring top-quality comfort for every cow, every time. When you offer DCC Waterbeds as a bedding solution to your customers, you are offering a premium product with an unparalleled 10-year limited warranty in free stall barns. DCC Waterbeds are straightforward to install, require little warranty work over time, and will help you build your customer base. What's even better, nearly 100% of the dairy producers who install DCC Waterbeds once go back to install more DCC Waterbeds over time. Every dairy is different. We want our dealers to look at the total farm system, assess how DCC Waterbeds will fit, consider the challenges, and be confident when they make a recommendation. Our sales reps are always available with references, knowledge, and support to help your customers solve their comfort challenges. DCC Waterbeds are a straightforward solution to a cow comfort problem. The simple design floats the cow. That is all. But like any technology, the details matter. We train our dealers in how to measure barns and ensure custom fit on each individual farm. We provide installation support so DCC Waterbeds can provide maximum comfort and minimal maintenance. A comfortable, clean, dry surface is the pinnacle of cow comfort. DCC Waterbeds provide comfort and the bed design helps ensure relative dryness by shedding liquid into the alley. Additionally, we provide resources for our dealers to assess farm goals and develop specific cleaning and bedding routines to ensure milk quality and cow cleanliness goals are being achieved.